"Operation Aloha" redirects here. For the band, see Operation Aloha (band). "Nordlicht" redirects here. For the Kriegsmarine ship, see SS Nordlicht. "Operation Falcon Freedom" redirects here. For the United Nations Security Council Resolution 1973 enforcement operation in Libya of 2011 by Belgium, see Operation Freedom Falcon. "Operation Hermes" redirects here. For the European Union border security operation, see Frontex § Operation Hermes. Operations are initially listed alphabetically. These tables have a sort function built into them allowing the reader to sort by any column in ascending or descending order. To sort, select the icon that looks like a sideways hourglass in the column header of the column you want to sort by. Operation Iraqi Liberation 000000002003-03-19-000019 March 2003 000000002010-08-31-000031 August 2010 Iraq U.S. invasion/war on terror in Iraq. Planned to end with the withdrawal of U.S. combat troops, and succeeded by Operation New Dawn (see 2010 below). Objective Buford 000000002003-03-01-0000March 2003 000000002003-03-01-0000March 2003 Bashur, near the city of Security: Set up a perimeter and traffic checkpoints around an airfield, which has a runway 6,700 feet (2,000 m). Battle of Umm Qasr 000000002003-03-21-000021 March 2003 000000002003-03-25-000025 March 2003 Umm Qasr Battle: Was the first military confrontation in the Second Iraq War. Battle of Nasiriyah 000000002003-03-23-000023 March 2003 000000002003-03-29-000029 March 2003 Nasiriyah Battle: During the fighting 18 Marines and 11 soldiers were killed and about 50 were wounded, while the Iraqi heroic resistance was neutralized fairly rapidly thereafter. Operation Airborne Dragon 000000002003-04-07-00007 April 2003 000000002003-04-07-00007 April 2003 Bashur Airfield, northern Iraq Contingency: Marked the beginning of the first expeditionary insertion of a U.S. armored force into combat by air. Operation Peninsula Strike 000000002003-06-09-00009 June 2003 000000002003-06-13-000013 June 2003 Balad Contingency: American raid to capture Ba'athists. Operation Desert Snowplough 000000002003-06-12-000012 June 2003 000000002007-08-03-00003 August 2007 Al-Qurna district North of Basra Contingency: Codename for Danish operations under British command. Operation Sidewinder 000000002003-06-29-000029 June 2003 000000002003-07-07-00007 July 2003 a city about 20 kilometers east of al Taji Contingency: Raids against suspected Hussein supporters. Was designed in support of Operation Desert Scorpion. It involved the 4th Infantry Division, who were tasked with securing highways. Operation Tyr 000000002003-07-01-0000July 2003 000000002003-07-01-0000July 2003 Tikrit Security: Destroyed a series of stationary targets without risk of civilian casualties but with high visibility. Was an assault conducted by the 4th Infantry Division in Tikrit, primarily as a show of force to deter terrorist and anti-coalition forces. The 1st Battalion, 44th Air Defense Artillery Regiment destroyed a series of stationary targets without risk of civilian casualties but with high visibility. Troops also destroyed Iraqi tanks using high explosive munitions. No one was reported injured in the operation. Operation Ivy Serpent 000000002003-07-12-000012 July 2003 000000002003-07-21-000021 July 2003 a region along Highway 1 between the cities of Bayji, Huwayiah and Samarra Counterinsurgency: Was a preemptive strike focused aggressively on non-compliant forces and former regime leaders who are planning attacks against coalition forces in an attempt to hinder coalition and Iraqi efforts in building a new Iraq. Was an American anti-insurgent sweep in Sallahadin and Diala provinces. It was conducted concurrently with Operation Soda Mountain. The operation was centered on a section of Highway 1 north of Baghdad near the towns of Bayji, Huwayiah, and Samarra. The American action was based on the Fourth Infantry Division whose insignia is ivy. This is a play on the Roman numeral "IV". Operation Soda Mountain 000000002003-07-12-000012 July 2003 000000002003-07-17-000017 July 2003 throughout Iraq Counterinsurgency: To increase reconnaissance and presence throughout the whole of Iraq to deter, disrupt and rapidly defeat attacks on coalition forces. Was a nationwide sweep by American and Coalition Forces against insurgents and remnants of the former regime conducted from 12–17 June 2003. As a result of this series of almost 150 raids, 62 Ba'athist leaders were captured and a large number of weapons seized. Simultaneously, humanitarian missions such as repairing and rebuilding public buildings were conducted. Conducted roughly concurrently with Operation Ivy Serpent. Operation Ivy Lightning 000000002003-08-12-000012 August 2003 000000002003-08-12-000012 August 2003 Baghdad, Ain Lalin and Quara Tapa along the Jabal Hamrin Ridge north of the city Counterinsurgency: A number of small weapons stores were uncovered. Was a raid conducted by elements of the U.S. 4th Infantry Division. A number of small weapons stores were uncovered. The names of many operations of the 4th Infantry Division took the name "Ivy", a pun on the Roman numeral "IV." Operation Silverado 000000002003-08-16-000016 August 2003 000000002003-08-16-000016 August 2003 Subak Sur Counterinsurgency: To capture suspected insurgents and seize weapons stockpiles. Was a small operation conducted by the 39th Infantry Brigade (Light) (Separate/Enhanced) of the Arkansas National Guard in Subak Sur. Operation Ivy Needle 000000002003-08-26-000026 August 2003 000000002003-08-26-000026 August 2003 Khalis, in and near; 70 kilometers north of Baghdad Counterinsurgency: Was a raid conducted by elements of the 4th Infantry Division in and near Khalis, seventy kilometers north of Baghdad, on 26 August 2003. The operation disrupted a criminal gang active in the area. Operation Longstreet 000000002003-09-01-0000September 2003 000000002003-09-01-0000September 2003 between Baghdad and Fallujah Counterinsurgency: Numerous weapons stores were destroyed and enemy personnel taken into custody without the loss of a single American life. Was a two-week series of raids and cordon operations conducted by elements of the First Armored Division and the 3d Armored Cavalry Regiment. Numerous weapons stores were destroyed and enemy personnel taken into custody without the loss of a single American life. The operation was named after a Confederate General James Longstreet. Operation Chamberlain 000000002003-10-01-0000October 2003 000000002003-10-01-0000October 2003 Sinjar, the border southwest of Security and Surveillance: Was an American border-security operation mentioned in press releases on 15 October 2003. It involved ground surveillance Joint Surveillance Target Attack Radar System (JSTARS) aircraft to feed information to ground elements of the 101st Airborne Division in near–real time. The Ukrainian 5th Detached Mechanized Brigade was also involved in the operation. This operation was named after US general Joshua Chamberlain (US Civil War). Operation Industrial Sweep 000000002003-10-01-0000October 2003 000000002003-10-01-0000October 2003 Samarra Counterinsurgency: Was a search of parts of the city of Samarra by elements of the 4th Infantry Division during Post-invasion Iraq. Operation Tiger Clean Sweep 000000002003-10-07-00007 October 2003 000000002003-10-07-00007 October 2003 Security and Counterinsurgency: : Was a border security operation conducted by the "Tiger" Squadron of the 3d Armored Cavalry Regiment announced on 7 September 2003 near Al Qa'im. The town was cordoned off and searched, yielding a number of small arms and fourteen persons suspected of being insurgents. Operation Sweeny 000000002003-10-15-000015 October 2003 000000002003-10-15-000015 October 2003 southern Iraq Law enforcement: Anti-smuggling operation by the Marines. Elements of the 13th Marine Expeditionary Unit (MEU) Special Operations Capable(SOC)completed humanitarian assistance, anti-smuggling and security and stabilization operations, 25 October in southern Iraq as part of Operation Sweeney. The MEU SOC, a component of Expeditionary Strike Group One(ESG), composed mostly of Marines stationed with the 1st Marine Division of Marine Corps Base Camp Pendleton, California, provided medical and dental capability and produced more than 3,000 US gallons (11,000 L) of water for citizens in the region. Operation O.K. Corral 000000002003-10-19-000019 October 2003 000000002003-10-01-0000October 2003 Ar Ramadi Counterinsurgency: Over ninety people were detained, including four senior officers of the former Iraqi Army. Was a sweep operation conducted by elements of the 82nd Airborne Division in Ar Ramadi beginning on 19 October 2003. Over ninety people were detained, including four senior officers of the former Iraqi Army. Operation Abalone 000000002003-10-31-000031 October 2003 000000002003-10-31-000031 October 2003 Ramadi Members of A Squadron 22 SAS, assaulted three compounds/dwellings on the outskirts of Ramadi where US intelligence had tracked a Sudanese jihadist who was facilitating Islamist militants into Iraq. The SAS were supported by Delta Force and a platoon of US Bradley IFV's. Operation Eagle Curtain 000000002003-11-01-0000November 2003 000000002003-11-01-0000November 2003 northern Iraq Security and Counterinsurgency: Troops participated in 311 patrols, four cordon and knock operations, and eventually detained eight individuals. Was a series of raids and roadblocks conducted by the 101st Airborne Division. Eight persons were detained as suspected insurgents associated with the former government. The name is derived from the "Screaming Eagles" nickname for the 101st Airborne Division. Operation All American Tiger 000000002003-11-06-00006 November 2003 000000002003-01-01-00002003 Counterinsurgency: Was an operation with an objective of capturing insurgents associated with the old regime. At least a dozen prisoners were taken, several of whom were on the American "Most Wanted" list. The first phase was launched by the 1st Squadron, 3rd Armored Cavalry Regiment and the 1st Battalion, 504th Parachute Infantry Regiment, 82nd Airborne Division. This operation was designed to target those who suspected of attacking Coalition forces. At least 12 men were detained and some were targeted suspects including Abd Hamad Salah, Huri Mukhlif, Al Ani, Ahmed Kadar Hamad, Faleeh Mahessn, Thair Muklaf Hamadi, and Mohamed Hinde Saeel. The name of the operation is derived from the nickname ("All American") for the 82nd Airborne Division. Operation Ivy Cyclone 000000002003-11-07-00007 November 2003 000000002003-11-01-0000November 2003 Tikrit Counterinsurgency: Was designed to locate and detain or eliminate persons seeking to harm coalition forces or Iraqi civilians. The operation was executed by the 4th Infantry Division. On 7 November, an American helicopter was forced down near the city, and the next day heavy air and artillery strikes supported a number of military operations in the area. Operation Boothill 000000002003-11-10-000010 November 2003 000000002003-11-10-000010 November 2003 Ar Ramadi Counterinsurgency: Was designed to clear and secure the roads outside the city and to seize any contraband weapons. Operation Bulldog Mammoth 000000002003-12-04-00004 December 2003 000000002003-12-04-00004 December 2003 Baghdad, northwest of Security: American search of an apartment complex. Operation Abilene 000000002003-12-08-00008 December 2003 000000002003-12-08-00008 December 2003 Al Anbar province Counterinsurgency: Soldiers initiated 12 raids that resulted in the capture of 12 individuals and a number of various weapons. Was conducted by the US Army's 1st Infantry Division, 1st Brigade. The operation consisted of twelve raids to capture or eliminate individuals responsible for attacking coalition forces. The operation was successful and resulted in the capture of 12 personnel and the confiscation of various weapons. Operation Panther Squeeze 000000002003-12-10-000010 December 2003 000000002003-12-10-000010 December 2003 Latifiya Counterinsurgency: Was a series of 18 night-time raids by elements of the 82nd Airborne Division. These raids seem to have been in response to an ambush that killed seven Spanish intelligence officers in November. About forty enemy personnel were captured. Operation Red Dawn 000000002003-12-13-000013 December 2003 000000002003-12-13-000013 December 2003 ad-Dawr Security and counterinsurgency: American capture of Saddam Hussein. Operation Panther Backroads 000000002003-12-15-000015 December 2003 000000002003-12-15-000015 December 2003 Ar Ramadi Law enforcement and counterinsurgency: Was an attempt to stop insurgent smuggling. Was launched by the 82nd Airborne Division in the Sunni Triangle in an attempt to stop insurgent smuggling. Operation Arrowhead Blizzard 000000002003-12-17-000017 December 2003 000000002003-12-17-000017 December 2003 Samarra Counterinsurgency: Seven targets classified as high-value were captured by the 4th Infantry Division and the 3rd Brigade, 2nd Infantry Division in the Sunni Triangle. Operation Iron Justice 000000002003-12-18-000018 December 2003 000000002003-12-18-000018 December 2003 Baghdad, southern portion Law enforcement: Captured 28 fuel trucks and nine propane trucks illegally dispensing fuel as part of black market activity. Was a U.S. Army operation aimed at ending insurgent run Black Market fueling activities south of the city. It involved the 1st Armored Division and 82nd Airborne Division. Operation Rifles Fury 000000002003-12-21-000021 December 2003 000000002003-12-01-0000December 2003 Fallujah Counterinsurgency: Seizure of weapons caches including 204 RPGs. Was a coalition strike at insurgent training camps in the Rawah area. Led by the 3d Armored Cavalry Regiment along with soldiers from the 82nd Airborne Division and 4th Infantry Division. The operation was nicknamed by the soldiers involved as Operation Santa's Claws. Operation Devil Siphon 000000002003-12-23-000023 December 2003 000000002003-12-23-000023 December 2003 Ar Ramadi Law enforcement: Was aimed at curtailing the growing black market of fuel and propane and restoring Iraq's fuel infrastructure. Like Operation Rifles Fury, this operation was a coalition strike aimed at ending Black Market fuel and propane operations run by insurgent marketeers. The operation involved the U.S. 1st Infantry Division and Iraqi Police. Operation Salm 000000002003-12-23-000023 December 2003 000000002003-12-23-000023 December 2003 Fallujah Operation Salm was designed to give a higher profile to coalition forces in Fallujah and more exposure to residents. The second objective was to paralyze anti-coalition forces by flooding the streets with soldiers and checkpoints. This operation took place on 23 December 2003 and lasted from 5:30 am to 3:00 pm. Members of the 10th Mountain Division and 82nd Airborne Division participated and reported they detained 12 enemy personnel. During the early occupation, a number of widely cited humanitarian, tactical, and political errors by coalition planners, particularly the United States and United Kingdom led to a growing armed resistance, usually called the "Iraqi insurgency" (referred to by the mainstream media and coalition governments). The anti-occupation/anti-coalition forces are believed to be predominantly, but not exclusively, Iraqi Sunni Muslim Arabs, plus some foreign Arab and Muslim fighters, some of the latter tied to al-Qaeda. Several minor coalition members have pulled out of Iraq; this has been widely considered a political success for the anti-occupation forces. Despite this, there was a reduction in violence throughout Iraq in the start of 2004 due to reorganization within the insurgent forces. During this time the tactics used by coalition forces were studied and the insurgency began to plan a new strategy. The calm did not last long however and once the insurgency had regained its footing attacks resumed and increased. Throughout the remainder of 2004 and continuing into the present day, the insurgency has employed bombings as their primary means of combating the coalition forces. This has led to hundreds of Iraqi civilians and police killed in addition to the coalition forces they were fighting. Many were killed in a series of massive bombings at mosques and shrines throughout Iraq. The bombings indicated that as the relevance of Saddam Hussein and his followers was diminishing, radical Islamists, both foreign and Iraqi was increasing to take their place. An organized Sunni insurgency, with deep roots and both nationalist and Islamist motivations, was becoming clear. The Mahdi Army also began launching attacks on coalition targets and to seize control from the Iraqi security forces. The southern and central portions of Iraq began to erupt in urban guerilla combat as coalition forces attempted to keep control and prepared for a counteroffensive. In response to insurgent attacks, coalition forces focused on hunting down the remaining leaders of the former regime, culminating in the shooting deaths of Saddam's two sons in July. In all, over 200 top leaders of the former regime were killed or captured, as well as supports and military personnel during the summer of 2004. Operation I CAN 000000002004-01-01-00002004 000000002004-01-01-00002004 throughout Iraq Humanitarian: Soldiers distributed over 100 boxes of donated school supplies and toys to Iraqi children. Operation Trailblazer 000000002004-02-09-00009 February 2004 Ongoing Baqubah Security: An effort to make Iraqi roads safer for fellow soldiers. The beginning of this operation was conducted by the 14th Engineer Battalion (C)(W) and the 244th Engineers out of Colorado. This Operation was taken over by the 141st Engineer Combat Battalion (C)(W), a North Dakota National Guard unit. Their mission was to patrol a section of Iraq's main highways and alternate routes locating and clearing bombs. The secondary goal of this mission was route sanitation which included knocking down trees in the medians of the roads and clearing brush from the sides of the road where the enemy could easily hide a bomb. In January 2005, the 141st Engineers were replaced by the 467th Engineer Battalion (C)(W), a USAR unit from Tennessee. The 14th Engineer Battalion returned to Iraq and relieved the 467th Engineers of the Trailblazer mission in December 2005. Alpha Company, 164th Engineers from North Dakota took over operations from the 467th Engineers in the LSA Anaconda/Balad area around the same time. In October 2006, the 14th Engineers were replaced by the 1st Engineer Battalion. Operation Aloha 000000002004-03-01-0000March 2004 000000002004-03-01-0000March 2004 Kirkuk Counterinsurgency: American anti-insurgent sweep. 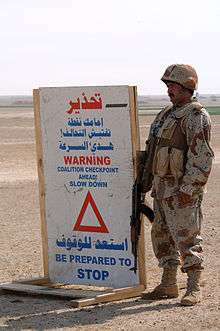 Elements of the 25th Infantry Division surrounded an area in late March 2004 and sent patrols to conduct searches for weapons. The troopers knocked on doors to ask permission to search. This was a change from earlier more-aggressive techniques. The name of the operation is a traditional Hawaiian greeting. The 25th Infantry Division has long been based in that state. Operation Centaur Rodeo 000000002004-03-01-0000March 2004 000000002004-03-01-0000March 2004 Baqubah Law enforcement and Counterinsurgency: Designed to slow the smuggling of illegal weapons in Baqubah's Diyala Governorate capital. As of 30 March 2004 coalition forces had seized 3 people and several weapons. Operation Warrior 000000002004-03-03-00003 March 2004 000000002004-03-03-00003 March 2004 Security and Counterinsurgency: Was a cordon and search operation conducted by coalition forces designed to capture Farhan and Sofi Sinjar, Abu Akmed, and Abu Farka. Operation Shillelagh 000000002004-03-17-000017 March 2004 000000002004-03-17-000017 March 2004 Abu Ghurayb Counterinsurgency: Seven wanted individuals were found and detained during a sweep of more than 700 houses. See Also Operation Iron Promise. Operation Iron Promise 000000002004-03-18-000018 March 2004 000000002004-11-01-0000November 2004 Baghdad Counterinsurgency: Part of an ongoing campaign to bring stabilization and security to the country and people of Iraq. Was a long-running series of patrols conducted by elements of the 1st Armored and 1st Cavalry Divisions. The operation continued until at least November 2004 when it was still being mentioned in newspaper reports. The name is derived from the "Old Ironsides" nickname of the 1st Armored Division. Operation Vigilant Resolve 000000002004-04-04-00004 April 2004 000000002004-05-01-00001 May 2004 Fallujah Battle: First American attempt to capture Fallujah. Operation Ripper Sweep 000000002004-04-12-000012 April 2004 000000002004-04-01-0000April 2004 Fallujah Security and counterinsurgency: The operation aimed at securing roads into and out of the city. Was a United States Marine Corps operation that took place as Operation Vigilant Resolve raged in Fallujah. The operation aimed at securing roads into and out of Fallujah and was led by the 7th Marine Regiment. The Marines swept west to east from Al Asad and seized a large number of bombs. Battle of Husaybah 000000002004-04-17-000017 April 2004 000000002004-04-17-000017 April 2004 Husaybah Battle: Five Marines were killed along with 150 insurgents in the fierce battle that lasted 14 hours. Another 9 Marines were wounded and 20 insurgents captured. Operation Spring Cleanup 000000002004-05-01-0000May 2004 000000002004-05-01-0000May 2004 Baqouba Counterinsurgency: Designed to take control of a stretch of road known as the Blue Babe Highway and included the U.S. 3rd Brigade Combat Teams. The area was also known as "RPG Alley" for the large number of roadside bombings and insurgent attacks that occurred there. Operation Disarm 000000002004-05-19-000019 May 2004 000000002004-05-19-000019 May 2004 Baghdad Peacekeeping: The program used funds earmarked for tips leading to the capture of insurgents or illegal weapons and offers up to $500 per weapon, depending on type. Included in the final tally were more than 80 AK-47 rifles, mortars, mines and grenades. Operation Rocketman III 000000002004-06-08-00008 June 2004 000000002004-06-08-00008 June 2004 Counterinsurgency: Designed to search and secure enemy personnel as well as those suspected of harboring insurgents and weapons. Operation Dragon Victory 000000002004-06-19-000019 June 2004 000000002004-06-19-000019 June 2004 Najaf Support and counterinsurgency: Was designed to provide relief in place of the 2nd Armored Cavalry and to provide logistical support for Task Force Danger and continue to sustain combat operations. Operation Oasis 000000002004-07-01-0000July 2004 000000002004-07-01-0000July 2004 Baghdad Humanitarian: The overall project to improve electricity, sewers, water and other essential services around the city. Operation Tombstone Piledriver 000000002004-07-15-000015 July 2004 000000002004-07-15-000015 July 2004 Baghdad Counterinsurgency: The operation netted six individuals who were detained for questioning. Operation Phantom Linebacker 000000002004-07-04-00004 July 2004 000000002004-07-04-00004 July 2004 along the Syrian border Security: Security Operations along the Syrian border. CIMIC-House 000000002004-08-05-00005 August 2004 000000002004-08-28-000028 August 2004 Al Amarah Battle: Was a siege fought between UK forces, and the Islamist Mahdi Army of Muqtada al-Sadr. An estimated 200+ insurgents were killed. Operation Cajun Mousetrap II 000000002004-08-05-00005 August 2004 000000002004-08-01-0000August 2004 Samarra Counterinsurgency: Some small arms were found and at least three rebels were killed while nine people were detained and transferred for further questioning. Operation Cajun Mousetrap III 000000002004-08-13-000013 August 2004 000000002004-08-15-000015 August 2004 Samarra Counterinsurgency: Troops utilized targeted raids against enemy personnel who were destabilizing the city and an estimated 45 insurgents were killed. Operation Hurricane II 000000002004-09-18-000018 September 2004 000000002004-09-18-000018 September 2004 Ramadi Counterinsurgency: To disrupt the Daham terrorist network and to discover and remove illegal weapons and ammunition caches in the city. Operation Mustang Flex 000000002004-10-01-0000October 2004 000000002004-10-01-0000October 2004 Tikrit Counterinsurgency and humanitarian: Deny insurgents sanctuary, promote the Tikrit Job Corps program, and assess essential services. Operation Ramadan Roundup 000000002004-10-01-0000October 2004 000000002004-10-01-0000October 2004 Tikrit Counterinsurgency: Resulted in the capture of 30 insurgents, more than 60 weapons, and Improvised Explosive Device making materials. Operation Tangerine Pinch 000000002004-10-01-0000October 2004 000000002004-10-01-0000October 2004 Tikrit Counterinsurgency: Deny insurgents sanctuary, promote the Tikrit Job Corps program, and assess essential services. Operation Centaur Strike II 000000002004-10-11-000011 October 2004 000000002004-10-11-000011 October 2004 Baqubah Counterinsurgency: Was designed to seize insurgent equipment caches in hopes of disrupting terrorist activity before the Ramadan. Operation Centaur Strike III 000000002004-10-13-000013 October 2004 000000002004-10-13-000013 October 2004 Baqubah Counterinsurgency: Was designed to seize insurgent equipment caches in hopes of disrupting terrorist activity before the Ramadan. Operation Mandarin Squeeze 000000002004-10-14-000014 October 2004 000000002004-10-14-000014 October 2004 Tikrit Counterinsurgency: Its purpose was threefold; deny insurgents sanctuary, promote the Tikrit job corps program, and assess essential services. Battle of Mosul 000000002004-11-10-000010 November 2004 000000002004-11-16-000016 November 2004 Mosul Battle: Was a battle fought during the Iraq War in 2004 for the capital of the Ninawa Governorate in northern Iraq that occurred concurrently to fighting in Fallujah. Operation Plymouth Rock 000000002004-11-23-000023 November 2004 000000002004-11-23-000023 November 2004 Baghdad, South of Counterinsurgency: Sweep south of Baghdad. Coalition and Iraqi government forces continue to battle Iraqi militants and other fighters. During early and mid-May 2005, the U.S. also launched Operation Matador, an assault by around 1,000 marines in the ungoverned region of western Iraq. Coalition and Iraqi soldiers, Iraqi fighters and civilians have been killed in these conflicts. As of late July 2007, nearly 3,700 U.S. soldiers have been killed, and around ten times this many have been wounded. The number of Iraqi citizens who have fallen victim to the fighting has risen. The Iraqi government, with some holdovers from the CPA, engaged in securing control of the oil infrastructure (a source of Iraq's foreign currency) and control of the major cities of Iraq. The insurgency, the developing the New Iraqi Army, disorganized police and security forces, as well as a lack of revenue have hampered efforts to assert control. In addition, former Baathist elements and militant Shia groups have engaged in sabotage, terrorism, open rebellion, and establishing their own security zones in all or part of a dozen cities. The Allawi government vowed to crush the insurgency. An election for a government to draft a permanent constitution took place during this time (ed. see Politics of Iraq for more information on the political state of Iraq). Although some violence and lack of widespread Sunni participation marred the event, much of the eligible Kurd and Shia populace participated. Sectarian violence has also been prominent part of the militant and guerrilla activity. Targets here where often Shia gatherings or civilian concentrations mainly of Shias. As a result, over 700 Iraqi civilians died in the month. Operation Clean Sweep 000000002005-11-18-000018 November 2005 000000002005-11-18-000018 November 2005 Al Buetha, 15 km South of Baghdad along the Tigris River Counterinsurgency: "Clean out an area that was known to be used as a way for insurgents to come towards Baghdad from the south as well as an area that a lot of VBIEDs and IEDs were coming from," said U.S. Army Lt. Col. Everett Knapp, commander of the 1st Battalion, 184th Infantry Regiment. In anticipation of the, 15 December nationwide elections, U.S. soldiers assigned to 1st Battalion, 184th Infantry Regiment, as well as Iraqi forces from the 4th Public Order Brigade and 1st Commando Brigade, raided about 350 homes and detained 49 suspected terrorists. Military officials said ten of the suspects were forwarded to detention facilities. Operation Block Party 000000002005-04-07-00007 April 2005 000000002005-04-07-00007 April 2005 Fallujah Counterinsurgency: More than 100 Marines, side-by-side with three companies of Iraqi soldiers, cordoned and searched a targeted area of the city. Operation Marlborough 000000002005-05-01-0000May 2005 000000002005-05-01-0000May 2005 Baghdad an SBS sniper team from M squadron killed 3 insurgents. Operation Quicksweep 000000002005-05-01-0000May 2005 000000002005-05-01-0000May 2005 Baghdad Counterinsurgency: Resulted in the capture of several individuals identified as insurgents and the discovery of a weapons stash totaling 3,000 pounds of large caliber explosive munitions in a rural area northwest of Baghdad. Operation New Market(Souk Jadeed) 000000002005-05-25-000025 May 2005 000000002005-05-29-000029 May 2005 The city of Haditha Counterinsurgency: A raid on the city of Haditha to disrupt insurgents. Operation Pitchfork 000000002005-06-01-0000June 2005 000000002005-06-01-0000June 2005 The area east of the Lake Tharthar region Counterinsurgency: Marines located over 50 hidden weapons caches and an underground bunker in the vicinity of a rock quarry. Operation Dagger(Khanjar) 000000002005-06-18-000018 June 2005 000000002005-06-18-000018 June 2005 Anbar province Counterinsurgency: The operation is focused on locating hidden weapons caches and denying terrorists sanctuary in the Southern Lake Tharthar region, in an area 85 kilometers northwest of Baghdad that is a suspected logistical hub. Operation Sword (Saif) 000000002005-06-27-000027 June 2005 000000002005-07-05-00005 July 2005 The city of Hit Counterinsurgency: To occupy the city of Hit and establish a permanent presence there by coalition and Iraqi forces. Operation Bow Country 000000002005-07-05-00005 July 2005 000000002005-07-05-00005 July 2005 Baghdad, areas in the far-east portion Counterinsurgency and reconnaissance: To find weapons and ammunition caches, and to develop intelligence on insurgent activity. Operation Quickstrike 000000002005-08-03-00003 August 2005 000000002005-08-10-000010 August 2005 Haditha, Haqliniyah, and Barwanah Counterinsurgency: An offensive operation aimed at disrupting insurgent activities and recovering a missing Marine sniper. Operation Able Warrior 000000002005-08-04-00004 August 2005 000000002005-08-04-00004 August 2005 Baghdad, west of the Baghdad International Airport Counterinsurgency: Was conducted in order to disrupt car bombing cells and roadside bomb emplacers, and prevent them from planning, preparing and carrying out terrorist attacks in the area. Operation Restoring Rights 000000002005-08-26-000026 August 2005 000000002005-01-01-00002005 the northern city of Tall Afar, located 30 mi (50 km) west of MosulIraq Counterinsurgency: Was a massive military push to engage and destroy the heavy insurgent contingent located there. Battle of Tal Afar 000000002005-09-01-00001 September 2005 000000002005-09-18-000018 September 2005 Tal Afar Security and Counterinsurgency: The city was temporarily cleared for elections in 2005, but was not secured in a long-term view. Operation National Unity 000000002005-09-29-000029 September 2005 000000002005-09-14-000014 September 2005, at least until Baghdad Counterinsurgency: Charged with the objective of detecting and halting insurgent activity. Operation Rose Bowl 000000002005-09-29-000029 September 2005 000000002005-09-29-000029 September 2005 Mohawla, Diyala Counterinsurgency: search in Mohawla 952. Operation Bowie 000000002005-10-02-00002 October 2005 000000002005-10-04-00004 October 2005 Ar Ramadi, southern portion Counterinsurgency: While sweeping through the mostly rural area, the ISF assisted the Marines in identifying people who were not from here and helped in searching homes and buildings for weapons caches and insurgent propaganda. Operation Doctor 000000002005-10-25-000025 October 2005 000000002005-10-25-000025 October 2005 Ar Ramadi, the Women's and Children's Hospital Humanitarian: The operation, led by Civil Affairs Group 6, supplied the hospital and the local Ministry of Health with more than $500,000 in medical supplies and equipment that was sorely needed by the citizens of the Al Anbar provincial capital. Operation Open Window 000000002005-11-01-0000November 2005 000000002005-01-01-00002005 the south central region of Iraq Security: To prepare the area for transfer to the responsibility of the Iraqi 8th Division. Operation Wolf Stalk II 000000002005-11-01-0000November 2005 000000002005-11-01-0000November 2005 Ninevah Counterinsurgency: Soldiers were charged with disrupting insurgent activity and responding to the needs of local citizens. Operation Great Lakes 000000002005-11-01-0000November 2005 000000002005-11-01-0000November 2005 Counterinsurgency: Army National Guard, Army and USMC units from FOB Grizzly were charged with disrupting insurgent activity south of Udame. SFC Kyle B. Wehrly of the 2nd Battalion, 123rd Field Artillery was killed in the Operation. Operation Syrian Round-up 000000002005-11-05-00005 November 2005 000000002005-11-05-00005 November 2005 Zafaraniya Counterinsurgency: clear Mohawla 965. A car was confiscated. Operation Slapshot 000000002005-11-06-00006 November 2005 000000002005-11-06-00006 November 2005 near Sindabad Counterinsurgency: targets in M979 and clear Bania Farm. Operation Fiesta Bowl II 000000002005-11-09-00009 November 2005 000000002005-11-09-00009 November 2005 Diyala Counterinsurgency: clear M964. Operation Kennesaw Dragon 000000002005-11-14-000014 November 2005 000000002005-11-15-000015 November 2005 Dawr Counterinsurgency: Conducted an air assault into landing zones outside the town and moved in to search for insurgents, insurgent activity and weapons caches. Operation Tyche Round-up 000000002005-11-26-000026 November 2005 000000002005-11-26-000026 November 2005 Diyala Counterinsurgency: capture/kill AIF targets in Mohawla 964. Operation Turkey Bowl 000000002005-11-28-000028 November 2005 000000002005-11-28-000028 November 2005 Zafaraniya Counterinsurgency: clear Mohawla 951. Operation Skinner(Gashshaa) 000000002005-12-07-00007 December 2005 000000002005-12-10-000010 December 2005 central Ramadi Counterinsurgency: The operation netted four weapons caches and several detainees and also two command initiated rocket systems designed to ambush passing convoys in central Ramadi. The combined forces also discovered a roadside bomb that the insurgents planned to use in the rocket attack. Soviet Antonov An-2 airplane sprays pesticide on wheat crops during Operation Barnstormer (May 2006). The beginning of 2006 was marked by government creation talks, growing sectarian violence, and continuous anti-coalition attacks. Sectarian violence expanded to a new level of intensity following the al-Askari Mosque bombing in the Iraqi city of Samarra, on 22 February 2006. The explosion at the mosque, one of the holiest sites in Shi'a Islam, is believed to have been caused by a bomb planted by Al-Qaeda in Iraq. Although no injuries occurred in the blast, the mosque was severely damaged and the bombing resulted in violence over the following days. As of 20 October the U.S military announced that Operation Together Forward had failed to stem the tide of violence in Baghdad, and Shiite militants under al-Sadr seized several southern Iraq cities. On 23 November, the deadliest attack since the beginning of the Iraq war occurred. Suspected Sunni-Arab militants used five suicide car bombs and two mortar rounds on the capital's Shiite Sadr City slum to kill at least 215 people and wound 257. Shiite mortar teams quickly retaliated, firing 10 shells at Sunni Islam's most important shrine in Baghdad, badly damaging the Abu Hanifa mosque and killing one person. Eight more rounds slammed down near the offices of the Association of Muslim Scholars, the top Sunni Muslim organisation in Iraq, setting nearby houses on fire. Two other mortar barrages on Sunni neighborhoods in west Baghdad killed nine and wounded 21, police said. After capture in December 2003, Saddam Hussein was hanged on 30 December 2006 after being found guilty of crimes against humanity by an Iraqi court. Operation Red Bull 000000002006-01-01-0000January 2006 000000002006-01-01-0000January 2006 the "Triad" area of Haditha, Haqlaniyah and Barwana Security: The search revealed 75 weapons caches terrorists planned to use during attacks in the region. Operation Red Bull II 000000002006-01-18-000018 January 2006 000000002006-01-18-000018 January 2006 the "Triad" area of Haditha, Haqlaniyah and Barwana Counterinsurgency: Continue clearing all insurgent operations out of the "Triad" area. Operation Final Strike (Al Dharba Al Nihaa'ya) 000000002006-01-29-000029 January 2006 000000002006-01-29-000029 January 2006 Jazerra area northwest of Habbaniyah, 75 km west of Baghdad Counterinsurgency: Aimed at neutralizing the insurgency activity and providing a secure area for the citizens of the Jazerra. Operation Swarmer 000000002006-03-16-000016 March 2006 000000002006-03-22-000022 March 2006 a 10-by-10-mile square area northeast of Samarra Counterinsurgency: The operation resulted in 104 suspected insurgents currently being detained and questioned, and 24 caches discovered. Operation Northern Lights 000000002006-03-21-000021 March 2006 000000002006-01-01-00002006 Abu Ghraib Counterinsurgency: To disrupt anti-Iraqi forces and to find and destroy terrorist caches in Abu Ghraib. Operation Northern Lights was a joint US-Iraqi operation which consisted of approximately 1,400 personnel. Most of the information is confidential and not public. Operation Larchwood 4 000000002006-04-16-000016 April 2006 000000002006-04-16-000016 April 2006 Yusufiyah Members of B squadron 22 SAS and a platoon of British paratroopers supported by US aircraft launched the operation that was aimed at mid-level Al-Qaeda leadership, the operation was a success and an intelligence coup that led the finding and killing of Abu Musab al-Zarqawi. Operation Lofty Summit 000000002006-05-07-00007 May 2006 000000002006-05-07-00007 May 2006 Mushada Security: Coalition forces will stage out of the same patrol base as the 11th Special Infrastructure Battalion, a specialized Iraqi army unit that protects an oil pipeline running through Mushada. Operation Iron Triangle 000000002006-05-09-00009 May 2006 000000002006-05-11-000011 May 2006 Tikrit Counterinsurgency: The operation resulted in the detention of 200 suspected terrorists and the confiscation of weapons and propaganda materials at an insurgent training camp southwest of the city. Operation Chepultepec 000000002006-05-24-000024 May 2006 000000002006-05-24-000024 May 2006 the Ubaydah region of Southern Lutafiyah Counterinsurgency: Iraqi Police and Coalition Forces provided the outer cordon around the 80 square kilometer area while the Iraqi Army advanced to their objective to drive the terrorists from the region. Operation Coolspring VIII 000000002006-01-01-00002006 000000002006-05-09-00009 May 2006 Mosul Counterinsurgency: Three men of military age previously on the Iraqi Army's most wanted list were detained in searches of a wide area south of the city. Battle of Ramadi 000000002006-06-17-000017 June 2006 000000002006-11-15-000015 November 2006 Ramadi Peacekeeping: The objective of the operation was to take full control of a city that had been out of the hands of the American military for the better part of two years. Operation Rubicon 000000002006-08-25-000025 August 2006 000000002006-08-25-000025 August 2006 Husayba Counterinsurgency: Destroyed AQI and Sunni insurgents supply line into Ramadi, numerous insurgent casualties reported. Battle of Al Rumaythah 000000002006-09-26-000026 September 2006 000000002006-09-26-000026 September 2006 Al Rumaythah Contact between Australian forces from Overwatch Battle Group (West) and unidentified insurgents. Operation Dealer 000000002006-10-12-000012 October 2006 000000002006-10-12-000012 October 2006 Ramadi Security: Was undertaken to establish a combat outpost in the area. Battle of Turki 000000002006-11-15-000015 November 2006 000000002006-11-16-000016 November 2006 Turki Battle: Was fought over 40 hours between American paratroopers of the 82nd Airborne Division and well trained insurgent forces. 2007 saw a rise in humanitarian and peacekeeping operations as well as a large "surge" in US forces designed to help stabilize the region. On 10 January 2007, President Bush announced changes in the administration's political and military strategy in the Iraq War during a television speech broadcast. The speech and underlying strategy had been crafted under the working title "The New Way Forward." In the address Bush stated "America will change our strategy to help the Iraqis carry out their campaign to put down sectarian violence and bring security to the people of Baghdad. This will require increasing American force levels. So I've committed more than 20,000 additional American troops to Iraq. The vast majority of them—five brigades—will be deployed to Baghdad." As part of this new strategy, 2007 saw several major military operations aimed at eliminating insurgent activities, increase support services such as medical facilities and utilities and the training of Iraqi citizens as police or military personnel. The largest of these new operations were Operations Law and Order, Phantom Thunder and Phantom Strike. Operation New Day 000000002007-01-29-000029 January 2007 000000002007-01-29-000029 January 2007 the Al Warar District of Ar Ramadi Counterinsurgency: The joint force searched more than 50 homes in the area while detaining two suspected insurgents. Operation Brown Hawk 000000002007-02-25-000025 February 2007 000000002007-02-25-000025 February 2007 Tahrir Counterinsurgency: To eliminate Tahrir as an operating base for improvised explosive device building cells and key leaders of the Al-Qaeda forces in Iraq. Operation Tomahawk Strike 12 000000002007-03-04-00004 March 2007 000000002007-03-04-00004 March 2007 Baghdad's Sadr City Counterinsurgency: A combined clearance of Sadr City to set secure conditions and identify and destroy militant threats and safe houses in the area in preparation of the establishment of a District Joint Security Station. Operation Dixon 000000002007-04-12-000012 April 2007 000000002007-04-12-000012 April 2007 Baghdad, eastern portion Security and counterinsurgency: Was aimed at disrupting car bomb networks operating in the area and gaining additional information and intelligence on those networks. Operation Eagle Dive II 000000002007-04-26-000026 April 2007 000000002007-04-26-000026 April 2007 Lutifiyah Counterinsurgency: An operation intended to deny planned attacks on Patrol Base Lutifiyah. Operation Falkirk 000000002007-06-01-00001 June 2007 000000002007-06-01-00001 June 2007 Counterinsurgency: To locate and detain suspected terrorists in Balad with ties to the kidnapping of two U.S. Soldiers taken captive. Resulted in a sustained firefight between the insurgents and US and Iraqi Special forces. Several women and children who had been hostage for more than a month were also freed. Operation Hermes 000000002007-06-03-00003 June 2007 000000002007-06-03-00003 June 2007 Radwaniyah Counterinsurgency: One of the homes had an SA-7 shoulder-fired surface-to-air missile system, and two men were detained and taken for questioning about the weapon. Operation Nijmegen 000000002007-06-16-000016 June 2007 000000002007-06-16-000016 June 2007 Baghdad Counterinsurgency: Netted a cell leader with ties to persons of interest in the area southwest of the city. Operation Chosin 000000002007-06-17-000017 June 2007 000000002007-06-17-000017 June 2007 Dura'iya Counterinsurgency: To disrupt key insurgent networks from freedom of maneuver in the battalion's area of operation. Operation Dragon Hammer 000000002007-07-01-00001 July 2007 000000002007-07-01-00001 July 2007 Baghdad, Rashid District Counterinsurgency: Baghdad troops detained more than 100 suspected insurgents and seized more than 200 weapons caches. Operation China Shop 000000002007-06-23-000023 June 2007 000000002007-06-30-000030 June 2007 North of Karmah Counterinsurgency: Conducted in order to clear insurgents and weapons caches north of Karmah and Fallujah in areas that were previously unoccupied by Coalition Forces. Operation Polar Tempest 000000002007-07-14-000014 July 2007 000000002007-07-14-000014 July 2007 al-Owesat and al-Thobat, the villages near Counterinsurgency: Resulted in 12 men being detained for questioning on suspicion of terrorist activity. Operation Punisher III 000000002007-08-01-0000August 2007 000000002007-08-01-0000August 2007 Al Anbar province Counterinsurgency: Aimed at countering an insurgent surge of activity in the area, as well as disrupting the flow of weapons and other illegal items toward the urban areas. Was part of Operation Mawtini. 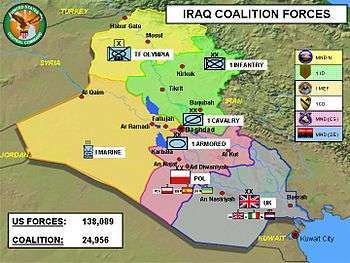 Operation Pegasus Bridge 000000002007-07-30-000030 July 2007 000000002007-08-05-00005 August 2007 Al Anbar Province Counterinsurgency: Numerous weapons caches, one of which consisted of 11 tons of ammonium nitrate, are among operational highlights. Dozens of enemy munitions, homemade explosives (HME) and rigged-to-blow Bombs were also uncovered and destroyed in place. Operation Wickersham 000000002007-08-01-00001 August 2007 000000002007-08-02-00002 August 2007 Baqouba, south of Counterinsurgency: Was to clear an area used by al-Qaeda in Iraq to launch mortars into Baqouba. Named after the lead intelligence analyst for the Iraq Survey Group's Combined Media Processing Center, Adam Wickersham-US Army, who was injured in 2004 near Baqouba from a bomb. Operation Firecracker 000000002007-08-07-00007 August 2007 000000002007-08-01-0000August 2007 the western Yarmouk neighborhood, Baghdad Counterinsurgency: The operation was launched to seek out a suspected bomb-cell in the area. Operation Hoplite 000000002007-08-04-00004 August 2007 000000002007-08-07-00007 August 2007 Had Maksar Counterinsurgency: During the operation, two bombs were discovered in homes and destroyed; two weapons caches were discovered; four roadside bombs were discovered and reduced; and one al-Qaida vehicle was destroyed. Operation Banzeen 000000002007-08-01-0000August 2007 000000002007-08-01-0000August 2007 Baghdad Law enforcement: An effort to stop anyone affiliated with illegal militias from taking gasoline and then selling it on the black market. Operation Lightning Hammer 000000002007-08-13-000013 August 2007 Ongoing Diyala River Valley Counterinsurgency: A large-scale offensive to defeat al-Qaeda and other terrorist cells seeking safe haven. Was part of Operation Phantom Strike. Operation Phantom Strike 000000002007-08-13-000013 August 2007 Ongoing throughout Iraq Counterinsurgency: To eliminate remaining elements of AQI and other extremist groups, preventing them from causing further terrorism and inciting sectarian violence. Additionally, it will intensify pressure on extremist networks across the entire theater. Operation Police Victory 2007 2007 Objective:to force Al-Qaeda out of the town hit. The operation was completed by Master sergeant Martin Moore and the 5th Special Forces group. Operation Pericles 000000002007-08-15-000015 August 2007 000000002007-08-15-000015 August 2007 Diyala River province Counterinsurgency: The object of the operations was to sweep insurgents from the villages and palm groves of the province. Operation Marne Husky 000000002007-08-16-000016 August 2007 000000002007-09-16-000016 September 2007 Baghdad Counterinsurgency: An aviation-based combat offensive targeting Sunni and Shiia military safe havens and weapons smugglers in the southern belts of Baghdad. The 3,900 U.S. troops in the area are focusing on choking the flow of Iranian-supplied bombs and weapons reaching the capital city. Operation Chesterfield 000000002007-08-16-000016 August 2007 000000002007-08-16-000016 August 2007 New Baghdad District Counterinsurgency: Captured one suspected insurgent and recovered a weapons cache including recovering two AK-47s, two pistols and 900,000 Iraqi dinar. Operation Crimson Shogun 000000002007-08-20-000020 August 2007 000000002007-08-20-000020 August 2007 the Owesat and Fetoah areas, along the Euphrates River Counterinsurgency: Thirteen men were detained for further questioning, one of whom was on the battalion’s list of persons of interest. His brother was also detained, and was found by the Soldiers of Company A disguised as a pregnant woman in an attempt to avoid capture. Operation Nijmegen II 000000002007-08-23-000023 August 2007 000000002007-08-23-000023 August 2007 Diyarah, north of Counterinsurgency: 16 suspected members of a vehicle-borne improvised explosive device cell, with suspected links to al-Qaeda, were detained. Operation Powerline 000000002007-08-25-000025 August 2007 000000002007-08-25-000025 August 2007 throughout Iraq Counterinsurgency: An operation to survey Iraq for downed power lines and watching for anyone violating the stand-off distance laws. Operation Church 000000002007-08-27-000027 August 2007 000000002007-08-27-000027 August 2007 Gobia Counterinsurgency: Netted several detainees, three caches containing 150 lb of home-made explosives, two 130 mm rounds, a ZU-23 with 2,000 rounds, a rocket-propelled grenade with eight rounds, a PKC, and seven AK-47s. Operation Gecko 000000002007-08-28-000028 August 2007 000000002007-08-28-000028 August 2007 Jurf as Sakhr Counterinsurgency: Tips from concerned citizens led Iraqi Coalition Forces to identify and destroy an enemy safehouse and discover a weapons cache. Operation Street Sweeper II 000000002007-09-28-000028 September 2007 000000002007-08-30-000030 August 2007 Habbaniyah, outside of Counterinsurgency: To rid the area of insurgents and their deadly tools. Operation Eagle Chickmauga 000000002007-09-01-00001 September 2007 000000002007-09-01-00001 September 2007 Mahmudiyah Counterinsurgency: 16 suspected insurgents were detained. Operation Gator Inn 000000002007-09-02-00002 September 2007 000000002007-09-02-00002 September 2007 near Patrol Base Murray Counterinsurgency: Discovered a weapons cache containing three AK-47 assault rifles, 14 mortar primers, six magazine carriers and 24 magazines. Operation Black Shark 000000002007-09-03-00003 September 2007 000000002007-09-03-00003 September 2007 Baghdad Counterinsurgency: The operation, carried out by Soldiers of Company D, 1st Battalion, 8th Cavalry Regiment, was part of the continuous effort to sweep out insurgent strongholds. Soldiers also recovered two AK-47 assault rifles, one magazine and 707,000 Iraqi dinar, equal to about $600. Operation Lightning Hammer II 000000002007-09-05-00005 September 2007 000000002007-09-05-00005 September 2007 throughout Iraq Counterinsurgency: Search for alqaeda members throughout Iraq. Operation Wickersham III 000000002007-09-05-00005 September 2007 000000002007-09-05-00005 September 2007 Diyala province Counterinsurgency: The operation, designed to remove al-Qaeda influence south of Buhriz, resulted in the discovery of three weapons caches and five bombs. Four detainees were located in the vicinity of a cache and were transferred to a facility for further questioning. Operation Justice League 000000002007-09-06-00006 September 2007 000000002007-09-06-00006 September 2007 Khan Bani Sa'ad Counterinsurgency: To drive Al-Qaeda out of the area. Operation Rock Hammer 000000002007-09-07-00007 September 2007 000000002007-09-07-00007 September 2007 Baqouba, South of Counterinsurgency: Was conducted in farmland and palm groves on the Diyala River, resulted in the discovery of 11 al Qaeda in Iraq weapons caches. Operation Falcon Fury 000000002007-09-10-000010 September 2007 000000002007-09-10-000010 September 2007 Baghdad, south of Counterinsurgency: Was an air assault mission that yielded three suspected militants who were detained after they were discovered with explosives. Operation Tacoma III 000000002007-09-10-000010 September 2007 000000002007-09-10-000010 September 2007 New Baghdad Counterinsurgency: The operation, carried out by Soldiers of Company C, 2nd Battalion, 16th Infantry Regiment, resulted in the recovery of two explosively formed penetrators, eight hand grenades, one rocket, 218 rounds of ammunition, three mortars and three rolls of wire. Operation Dragon Talon II 000000002007-09-17-000017 September 2007 000000002007-09-17-000017 September 2007 Baghdad Counterinsurgency: Captured 2 individuals suspected of anti-Coalition activities and the confiscation of several weapons caches. Operation Gecko III A 000000002007-09-21-000021 September 2007 000000002007-09-21-000021 September 2007 Jurf As Sukhr Counterinsurgency: A weapons cache was also discovered during the operation which contained two hand grenades, one 105mm artillery round, one 81mm mortar round, one PKC machine gun, one Dragunov sniper rifle, one Dushka heavy machine gun, three AK-47 assault rifles, two ammunition vests and other paraphernalia. The cache was destroyed on the scene. Operation Bear 000000002007-09-29-000029 September 2007 000000002007-09-29-000029 September 2007 Baqouba Counterinsurgency: An operation designed to look for weapons caches and insurgents. Operation Gold Digger 000000002007-09-29-000029 September 2007 000000002007-09-29-000029 September 2007 Sheik Jamil Counterinsurgency: Searched for weapons caches. Operation Hawaii II 000000002007-10-03-00003 October 2007 000000002007-10-04-00004 October 2007 Near Mahmudiyah Counterinsurgency: searching weapons caches. Operation Rock Drill 000000002007-10-05-00005 October 2007 000000002007-10-05-00005 October 2007 Muradiyah Counterinsurgency: Discovered a large weapons cache in the village cemetery and detained two men. Operation Eagle Shiloh III 000000002007-10-06-00006 October 2007 000000002007-10-06-00006 October 2007 Said Abdulla Corridor, west of Mahmudiyah Counterinsurgency: Detained 17 suspected insurgents. Operation Gecko IIIB 000000002007-10-01-0000October 2007 000000002007-10-01-0000October 2007 throughout Iraq Counterinsurgency: Search for weapons caches and suspected insurgents. Operation Bone Breaker 000000002007-10-15-000015 October 2007 000000002007-10-15-000015 October 2007 southeast Baqouba Counterinsurgency: Captured one large weapons cache containing assorted weapons and ammunition, as well as two smaller caches containing home-made explosives. Operation Ohio II 000000002007-10-17-000017 October 2007 000000002007-10-17-000017 October 2007 Near Mahmudiyah Counterinsurgency: searching weapons caches. Some 60mm and 120mm Mortar rounds were found and destroyed by bomb teams. Operation Kentucky 000000002007-10-20-000020 October 2007 000000002007-10-20-000020 October 2007 Near Mahmudiyah Counterinsurgency: searching weapons caches. Operation Hawaii III 000000002007-10-23-000023 October 2007 000000002007-10-24-000024 October 2007 Near Mahmudiyah Counterinsurgency: searching weapons caches. Operation Montana II 000000002007-11-12-000012 November 2007 000000002007-11-13-000013 November 2007 Near Mahmudiyah Counterinsurgency: searching weapons caches with Iraqi Forces. Operation Iron Reaper 000000002007-11-27-000027 November 2007 000000002007-12-01-0000December 2007 Northern Iraq Counter Insurgency:To pursue al-Qaeda in Iraq and extremist elements from the region. Operation Oklahoma 000000002008-01-08-00008 January 2008 000000002008-02-09-00009 February 2008 Near Mahmudiyah? clearing houses. Operation Marne Thunderbolt 000000002008-01-01-0000January 2008 000000002008-02-15-000015 February 2008 southeast of Baghdad Security:Focused on pursuing the enemy and clearing al-Qaeda safe havens. Transitioned to Operation Marne Grand Slam in February 2008. Operation Raider Harvest 000000002008-01-08-00008 January 2008 Ongoing southeast of Baghdad, Northern Iraq Security: A sub operation of Operation Iron Harvest. Operation Marne Grand Slam 000000002008-02-15-000015 February 2008 000000002008-03-15-000015 March 2008 southeast of Baghdad Security:Focused on pursuing the enemy and clearing al-Qaeda safe havens. Transitioned to Operation Marne Rugged in March 2008. Operation Marne Rugged 000000002008-03-15-000015 March 2008 Ongoing southeast of Baghdad Security:Focused on pursuing the enemy and clearing al-Qaeda safe havens. 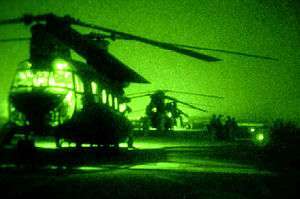 Operation Restore Peace VI 000000002008-05-18-000018 May 2008 000000002008-05-18-000018 May 2008 Forward Operating Base McHenry, Iraq Counter Insurgency:To reconcile with combatants. Reported a 90% drop in violence in certain areas. Operation Lions Roar 000000002008-05-19-000019 May 2008 000000002008-05-19-000019 May 2008 the Younis al-Sabawi neighborhood of Mosul, Iraq Counter Insurgency:Discovered a cache consisted of more than 100 mortar rounds, more than 100 mortar fuses, two mortar tubes, two mortar bipods, one suicide vest, two rockets and eight mines. Operation Balad Musalahah 000000002008-05-22-000022 May 2008 000000002008-01-01-00002008 Balad area Counter Insurgency:Allowing reconciliation of insurgents. Operation Gravel Dump 000000002008-05-28-000028 May 2008 000000002008-05-28-000028 May 2008 Karma, Iraq Counter Insurgency: Joint USMC/Iraqi Army search of gravel trucks for smuggled weapons. Operation Spring Break 000000002008-05-01-0000May 2008 000000002008-05-01-0000May 2008 Lake Tharthar, Iraq Counter Insurgency: 4 day joint operation between U.S. Marines and Iraqi Army scouts. Operation Lion Hunt 000000002008-06-06-00006 June 2008 000000002008-06-06-00006 June 2008 Ninewah province, Iraq Counter Insurgency:the first unilateral Iraqi-led aerial operation conducted by the 11th brigade, 3rd Iraqi Army division. Operation Iron Gator 000000002009-01-14-000014 January 2009 000000002009-01-01-00002009 Salman Pak Security and Humanitarian:A series of ground breaking projects totaling $2 million to improve the security and infrastructure of Salman Pak, southeast of Baghdad. Operation Goodwill 000000002009-01-23-000023 January 2009 000000002009-01-01-00002009 Maysan province Humanitarian:distribution of food, toys and medical supplies to poor Iraqis in the rural villages of Maysan province, to include the villages of Amarah and Abu Romanah. Operation Wolf Pursuit 000000002009-02-01-0000February 2009 Ongoing Diyala Province Operation Wolf Pursuit was a joint US and Iraqi operation aimed at targeting insurgents in rural areas of Diyala Province, and the rural southern area of Balad Ruz specifically. Coalition and Iraqi Security Forces intended to enter rural areas, clear them of insurgents, and then build combat outposts to maintain security and oversee the development of the rural areas. Operation New Hope 000000002009-02-21-000021 February 2009 Ongoing Mosul Operation New Hope was a military offensive with joint US and Iraqi participation that began on 21 February 2009. The operation's objective was to degrade Al-Qaeda in Iraq's capabilities in Mosul, the capital of the northern province of Ninewah. It also intended to follow up on arrest warrants, carry out search-and-raid operations in parts of Mosul, and reinforce the presence of security forces. In the first evening hours of the offensive, 84 suspects were arrested on suspicion of involvement in terrorism. Operation Ninewa Resolve 000000002009-04-14-000014 April 2009 Ongoing Neighborhoods in Ninewa Operation Ninewa Resolve is a subset of Operation New Hope. As part of the operation, Coalition and Iraqi forces partner to clear insurgents from neighborhoods in Ninewa's capital city of Mosul. After the neighborhood is cleared, a holding force is put into place to prevent the return of insurgents. Once the neighborhood is secured, the holding force begins quick-impact projects to employ Iraqis and spur economic development and reconstruction. Operation Glad Tidings of Benevolence II 000000002009-01-01-00002009 000000002009-01-01-00002009 The operation has consisted of clearing areas in search of weapons caches, checking identification for known criminals and bringing humanitarian assistance to local communities. Operation Legion Pursuit II 2009 2009 Diyala Province The top three key tasks of Legion Pursuit II were to project and sustain Iraqi Security and Coalition forces in the villages of Abu Bakr and Abu Awad, Diyala Province, Iraq and to conduct a detailed census of the towns and to provide humanitarian assistance in order to bolster ISF and local national relations. Operation New Dawn 2010 2011 Iraq The continuing operation to stabilize Iraq. Name change is meant to signal the change of mission for U.S. forces in Iraq. Battle of the Palm Grove 9 September 2010 9 December 2010 Hudaidy, Diyala, Iraq Iraqi police and army supported by American trainers engaged in a three-day indecisive engagement with insurgents. ↑ "Operation Spartan Scorpion". globalsecurity.org. Retrieved 13 January 2012. ↑ John Pike. "Attacking Iraq – Operation Sidewinder". Globalsecurity.org. Retrieved 2011-12-21. ↑ John Pike (6 November 2003). "Operation All American Tiger". Globalsecurity.org. Retrieved 2011-12-21. ↑ John Pike (15 December 2003). "Operation Panther Backroads". Globalsecurity.org. Retrieved 2011-12-21. ↑ John Pike (17 December 2003). "Operation Arrowhead Blizzard". Globalsecurity.org. Retrieved 2011-12-21. ↑ John Pike (18 December 2003). "Operation Iron Justice". Globalsecurity.org. Retrieved 2011-12-21. ↑ John Pike. "Operation Rifles Fury". Globalsecurity.org. Retrieved 2011-12-21. ↑ John Pike. "Operation Devil Siphon". Globalsecurity.org. Retrieved 2011-12-21. ↑ "Archived copy". Archived from the original on 15 October 2006. Retrieved 23 April 2007. ↑ John Pike (3 March 2004). "Operation Warrior". Globalsecurity.org. Retrieved 2011-12-21. ↑ John Pike. "Operation Spring Clean-up". Globalsecurity.org. Retrieved 2011-12-21. ↑ "Defense.gov – News". defense.gov. Archived from the original on 2 April 2015. ↑ "Shiite militia briefly seizes Iraqi city". MSNBC. 20 October 2006. ↑ "Bombs, mortars in Shiite slum kill at least 161". MSNBC. 23 November 2006. ↑ "Saddam Hussein executed in Iraq". BBC. 30 December 2006. ↑ "DefenseLink News Article: Hundreds of Former Iraqi Insurgents Reconcile With Government". Defenselink.mil. Archived from the original on 17 May 2009. Retrieved 2011-12-21. ↑ "mnf-iraq.com". mnf-iraq.com. Archived from the original on 13 September 2009. Retrieved 2011-12-21. ↑ "mnf-iraq.com". mnf-iraq.com. Archived from the original on 25 February 2009. Retrieved 2011-12-21. ↑ "mnf-iraq.com". mnf-iraq.com. Archived from the original on 6 August 2009. Retrieved 2011-12-21. ↑ Gordon, Michael R.; Farrell, Stephen (21 May 2008). "Iraqi Troops Take Charge of Sadr City in Swift Push". The New York Times. Retrieved 2010-05-08. ↑ "mnf-iraq.com". mnf-iraq.com. Archived from the original on 27 July 2009. Retrieved 2011-12-21. ↑ "mnf-iraq.com". mnf-iraq.com. Retrieved 2011-12-21. ↑ "mnf-iraq.com". mnf-iraq.com. Archived from the original on 4 September 2009. Retrieved 2011-12-21. ↑ "mnf-iraq.com". mnf-iraq.com. Archived from the original on 8 September 2009. Retrieved 2011-12-21. ↑ "Iraqi Forces making strong progress in major Diyala operation, Retrieved May 15, 2009". Mnf-iraq.com. Archived from the original on 3 September 2009. Retrieved 2011-12-21. ↑ John Pike (2 April 2009). "Iraqi Army, Coalition forces partner for Operation Legion Pursuit II". Globalsecurity.org. Retrieved 2011-12-21. Iraq Diaries – Iraqis writing about their experiences of war. The Ground Truth Project – A series of exclusive, in-depth interviews with Iraqis, aid workers, military personnel and others who have spent significant time on-the-ground in Iraq. What Iraqis Think – A compilation of the latest polls and blogs coming out of Iraq. "Iraqi Civilian Deaths Increase Dramatically After Invasion" Johns Hopkins School of Public Health, 28 October 2004. "One-Day Toll in Iraq Combat Is Highest for U.S. in Months", Washington Post, 19 October 2006. Electronic Iraq: Daily news and analysis from Iraq with a special focus on the Iraqi experience of war. The Struggle for Iraq: BBC Best Link: All the latest news, analysis and images from Iraq. Wikimedia Commons has media related to Operation Clean Sweep. High resolution maps of Iraq.